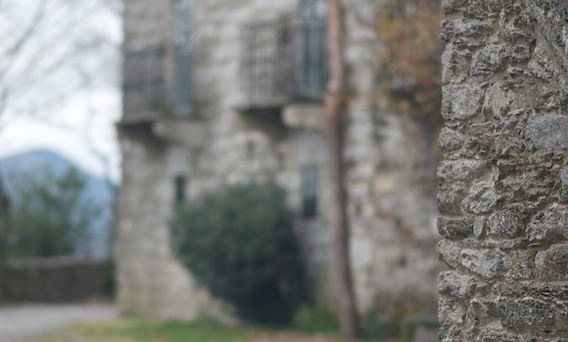 Galicia is the final destination of the way of St. James. Galician Gastronomy is one of the good reasons to visit this region both you are a hiker or a standard tourist. 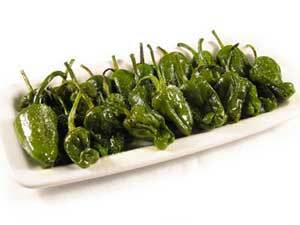 You should not miss the delicious dishes that this part of Spain can offer to you. If you do the Camino Frances, the Camino Portugues or the Camino Primitivo, you will be able to have this kind of exquisite food in plenty of bars, inns, taverns and restaurants. Most of them are inexpensive and genuine. You can also enjoy the tapas bars in Santiago´s old town. Rúa do Franco is a popular street where you can see fresh fish and seafood displayed in refrigerated windows that spill out on the pavement. Unfortunately, Rúa do Franco is often too touristic and, consequently, a little more expensive. 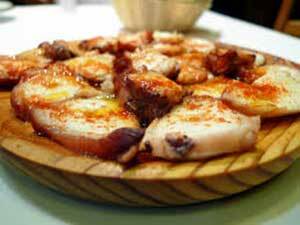 this is a regional speciality which consists on octopus served on a wooden platter drizzled in olive oil and dusted in paprika and marine salt. Although you have never tried octopus before, you should not miss this opportunity. It´s truly a delicatessen. Pork . Pork can be served in many ways. Ham is a very popular food and it can be eaten as an aperitif, accompaniment or even in sandwiches. “Lacón galego”(Galician Pork shoulder) is usually served with “grelos” turnip greens, this dish is called “lacón con grelos”. However, the gastronomic possibilities of Pork Shoulders are enormous and they can be accompanied by any kind of greens or potatoes to create a delicious meal. 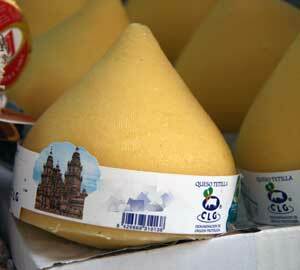 Galician potatoes and Pork shoulder have got seal of origin due to their high quality. 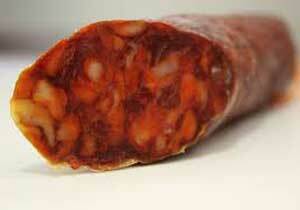 (Galician Pork Sausage) is made by filling thin pork tripe with ground pork and generously seasoned with paprika. 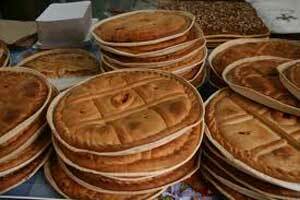 It can be eaten into fine slices as an aperitif at any time of day or can be cooked in a wide variety of ways. As a fast and delicious meal it can be fried along with eggs and fries. “Ourella de porco”(Pork ears).Pork ears seasoned with paprika and salt and served as an aperitif. Even though this may seem too exotic or even repulsive at first, this is one of my favorites. (Traditional Galician Pie). The “empanada” is the appetizer choice in this region. It can be made of different ingredients such as beef, chicken, octopus, cod and raisins, tuna, baby scallops, pork and so on. A good option to take a piece in your backpack if you are hiking the camino. Besides, Galician bread is example of high quality. It´s worth stopping at a local bakery and wasting your time enjoying different kinds (bread of Cea, bread of Carral, “pan de millo” (corn bread) among others. ( Galician Stew and Broth). They are usually eaten in cold and rainy seasons. Made of different types of meat (pork, veal and poultry) and vegetables (turnip greens, beans, potatoes..). Tetilla cheese, Arzúa-Ulloa cheese, San Simón cheese and Cebreiro cheese are well-known cheese varieties made from cow´s milk and are usually mild or semi-cured. “Tarta de Santiago” (Santiago Cake). 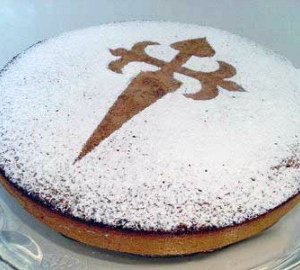 This is a traditional almond cake that has Santiago´s cross drawn in powered sugar. “Marron Glacé” (Chestnut Delicatessen. Only one variety of Galician chestnut can be used to produce this exquisite sweet. Marrón Glacé is extremely tender, intensely sweet even to the very heart of the chestnut. It has a perfumed vanilla aroma and is made in an ancient and jealously guarded secretive process that makes it a gastronomic jewel. Honey. Galician honey is guaranteed and certified through the Galician Honey Geographic Protection. There are many varieties but it always contains flower and fruit properties. Cheese, Marrón Glacé, honey and tarta de Santiago are nice souvenirs that you can find in lots of groceries and take home after the camino. 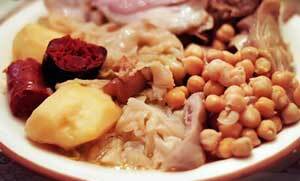 Live the camino and enjoy some of these dishes when you come to Galicia, I promise you won´t regret it.